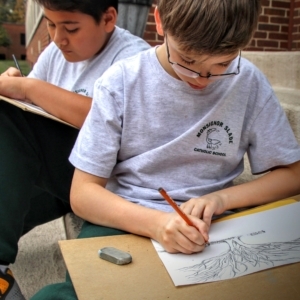 Students are encouraged to participate in a wide variety of art programs at Monsignor Slade. Opportunities include art, drama, and music. Participation in these programs enhances students’ creativity and communication skills. All Monsignor Slade K-8th grade students participate in weekly art classes. These classes give our students experiences with a variety of tools, techniques, and processes to create their own artwork. Middle schoolers have an opportunity to join Art Club, which runs throughout the year and encourages creativity and artistic learning for a small group of interested students. All year long, student artwork is displayed in our main hallway for everyone to enjoy. Additionally, each spring student art work is showcased at the North County Public Library. Each year, Slade students in Middle School may choose to try out for the Spring Musical. The goal for this program is to engage students in the practical application of theatre techniques, which can also be applied to their other classes. Slade Students have opportunities to act on stage or be part of the lighting, stage, or makeup crews. Participating builds self-confidence while also teaching our students to creatively express their thoughts and solve problems related to staging and acting in a show. All this hard work and dedication culminates in three performances over a spring weekend, much anticipated by our entire community. Our drama program is very successful and one of the highlights of Middle School! Monsignor Slade students participate in weekly music classes. Students develop musical skills by participating in a variety of activities. While students sing, play classroom instruments, and listen to music, they will be developing the understanding of and the appreciation for music from different cultures, time periods, and genres. Students in grades K-3 participate in our annual Grandparents Day Program and in our annual Christmas Pageant, which provide the students the opportunity to perform musically for their families. Students in grades 4 & 5 may choose to join the Intermediate Chorus which performs at our school Masses and at our annual Christmas Pageant. Flute-a-phones: Beginning in 3rd grade, students are invited to join the Flute-a-phone program where they develop their basic skills in music theory. Beginner Band: In 4th and 5th grades, students have the opportunity to learn how to play an instrument in the Beginner Band. Students receive in-school lessons once a week throughout the school year, and they have the opportunity to participate in the Spring Concert where they can showcase their developing talents. Concert Band: Students in grades 5 & 6 may participate in Concert Band. Students in Concert Band receive in-school lessons once a week and they also have a 60-minute rehearsal after school once a week. Concert Band students participate in both the Winter and Spring Concerts. In addition, they participate in a yearly competition in Hershey, Pennsylvania. 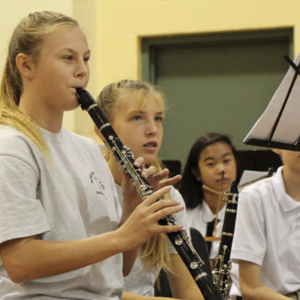 Symphonic Band: Students in grades 7 & 8 may participate in Symphonic Band. Students in Symphonic Band receive in-school lessons once a week and they also have a 90-minute rehearsal after school once a week. Symphonic Band students participate in both the Winter and Spring Concerts. In addition, they participate in a yearly competition in Williamsburg, Virginia. The purchase of a band uniform, which includes tuxedo shirt, black dress pants, black belt, black socks, and black shoes, is required of all symphonic band members. In addition, a bow tie and cummerbund have been purchased by the Home and School Association and are loaned to the symphonic band members each year. Representational Band: Students in grades 7-8 may be asked to participate in the Representational Band. This band includes students from schools throughout the Baltimore Archdiocese. After meeting five times to practice their material, the Representational Band performs a concert for the families of the students. Monsignor Slade is well known within the highly competitive school band community for its award-winning bands!